Phew! I know how wack my blog name sounds. Trust me, I lost 50 pounds searching for the perfect blog name. Finally- “foolproof musings of a weirdie” seemed good enough. I did the happy dance and thought to myself how cool it was and how I had finally come up with something catchy. My folks thought it was good too. I thought to myself –they‘ll not think the blog name is wack cus it says I‘m a weirdie so i should have a weird blog name plus any lame thing i blog about will be expected. I didn’t think anyone would be interested in my thoughts so the blog names-“life of simofutet” and “Sim’s journal” flew out the window as quickly as they came in. Seriously Sim, who cares about your boring thoughts? You are not a fun person. I soliloquied. No name seemed good enough, or captivating enough. I mean, who’ll see “foolproof musings of a weirdie and say cool name I should totally check out that blog! No one! I don’t do well with crowds, I don’t know how to let go literally. Some people say I am uptight and they might not be far from the truth. I hang out with people and all that comes out of my mouth are my ambitions. A lot of people say I am anti-social but i don’t think so, atleast the people who know me, know I am not. Albeit, I believe I am anti- idiot. I am a bit of a loner and oftentimes, I don’t act the way people think is “ideal”. My favourite form of exercise is coiling up with a good book or movie or simply taking a long shower. So I feel it is all these things and more that make me unique and weird to other people. Sometimes I feel like my blog name suits me and other times I think about how stupid it is. Please let me know what you think about my blog name and I‘ll love to read how you came up with yours. “Anti-idiot”. A-ha! This is why I knew I liked you! Yes, coming up with a blog name is just so exhausting. My blog name… which one is my blog name anyway? Are we talking about the title of my blog, which is seen when you visit my site? (One day at a time… To stop a whirlwind.) Or my blog name which you can see when I post (floatinggold)? Or the url on my blog (dailyflabbergast). This is so complicated. LOL. It reflects how all over the place I can be. I think blog name is the site title…(atleast that’s what it means to me)😂 😂 😂. LOL…someone should read this and help us out. To be honest, I don’t think is worth any headache. If it’s any consolation, everyone thinks they are weird. If you find and interact with people who get you, you’ll realise how regular you are, just a few quirks here and there. In time you can rebrand if you find a name that better suits you. Most bloggers rebrand as they grow. All the best love. It is good to know the rebrand option is always available. Thanks a bunch for stopping by.😊. murisopsis is my blogging name which is Latin – made of the word muris meaning mouse and opsis denoting vision… mouse vision. My blog title is “A Different Perspective” which relates to my looking at topics and issues from the mouse’s point of view… So now you know. As for your title, I do believe it is “foolproof” since it is smart and witty! Oh..great! this post is about the blog title not the blog name😂😂 ….I’ll change it. Almost five years of blogging! Woah! I’m just entering my fifth month. Thanks for sharing your thoughts, I’ll do some research and perhaps make a change before I upgrade to a paid plan. Thankyou for stopping by, I really hope you stick around. Coming up with a blog name wasn’t hard for me shaa. Twas coming up with the name for a facebook page. So when I ventured into blogging, finding a name wasn’t a difficult thing. I had found my name long before I started blogging. Lol “Shards of bards” sounds really cool, atleast you benefited from the research you carried out. I don’t think it’s a weird name at all. 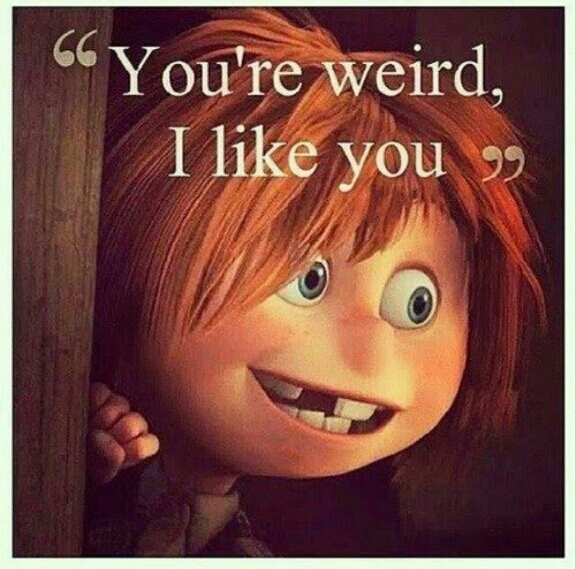 Sometimes the things that make us “weird” are the things that best define us. For instance, I have a Christian blog that focuses on Christian aspects; if people called it weird that is okay because that doesn’t define who I am and what my blog is about. I liked when you said, “I don’t do well with crowds, I don’t know how to let go literally.” because I can relate. I don’t like crowds and try to stay as far away from them as possible, but on the other hand; if it’s a group discussion or something like that then I am okay. I couldn’t agree with you more! . An emphatic YES to “the things that make us weird are the things that best define us”. I really appreciate your feed back, thanks for stopping by.❤❤❤❤. I understand what you mean by weird and searching off 60pounds. My twitter name was “poopForbrains” for about a year and half because I was simply tired of generic names and I couldn’t think of anything befitting for me. We’ll find a befitting name someday or perhaps we never will😜 . I just imagined a group of people talking and came up with cliquetalk. Your blog posts are so natural and witty, you always have me hooked from the first word….. I know you have fun writing every blog post so it’s no suprise a blog title was a cakewalk. Hi 🙋 Sim… First time blog commenter and here’s what I’ve got to say. First of all, having a weird blog name or title isn’t bad as a matter of facts, it’s yours so call it whatever you wish… Where the problem comes in is when the blog name and blog URL don’t sync. It’s a big NO for me and search engine spiders. Remember you putting stuff online for people globally to read. You need to tell them you’re very professional in your weird way. I think I might go with Sim’s journal or the other alternative you gave but bottom line is… Blog name and URL must be 99% same. Come 2018 it would be my 5th year as a blogger… I’m a herbal blogger at http://www.herbalgang.com and you’ve got originality in your writings. I actually like the new name, its creative, especially with all the colourful interactions and you know what they say : if it suits you, do you! Currently just changed mine this Morning and i think the future looks clear. Lol. It sounds good to me👧. You can always change it if changing it will make you feel better. However, you’ll be unavailable on search engines for some days plus you have to let your readers know that you’ll be making some changes. I did it. They didn’t appear on search engines for about 3days and then everything was restored with the new changes.